Upon Golden Glider’s release—or escape—from a psychiatric hospital to which she had been sentenced, she decided she needed a new partner in crime. She stole her brother Captain Cold’s weapons and outfitted her current lover—a dull-witted hunk who had taken care of her in the hospital—as Chillblaine. Ironically, on their first crime together, she was possessed by Eclipso and killed him (Flash Annual 5, 1992). After that disaster, the Glider remained in the background, outfitting other Chillblaines of the same type: handsome, strong, stupid. Few of them had long careers; most were arrested (and abandoned) after their first crime. Eventually someone who wasn’t quite so stupid caught onto her M.O. He played up to it, became the new Chillblaine, and once he had entered into a secret alliance with Abra Kadabra and Polaris, killed the Glider (Flash #113, 1996). However, though he was bright enough to build a machine that would freeze Keystone, he wasn’t in his partners’ league... and they killed him because his grandstanding threatened to lead back to their secret project (Flash #115, 1996). At least that’s what everyone thought. He had actually set up someone else to die in his place, then gone into hiding. 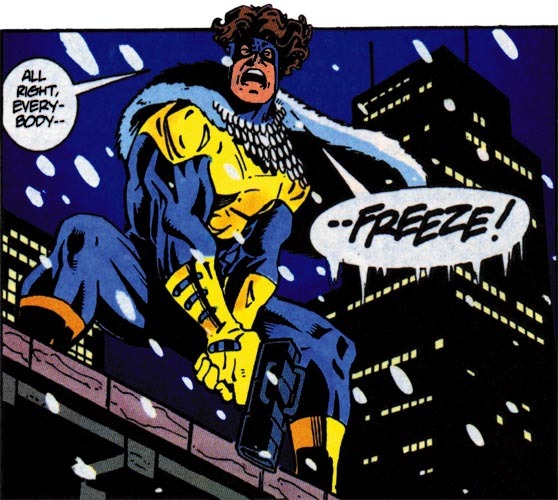 Eventually he was tracked down by Captain Cold, who killed him to avenge his sister’s death. Chillblaine IV: Flash (second series) #115 (July 1996) - Oscar Jimenez and José Marzan, Jr.
Chillblaine II: Flash (second series) #88 (March 1994) - Mike Wieringo and José Marzan, Jr.
* Chillblaine actually appeared first in an alternate future (see Armageddon 2001). In this future, the Golden Glider survived at least the next ten years, as she and the sixth Chillblaine participated in Diogenes’ plot.